Designed to be virtually unnoticeable, Doc's Promolds is an inexpensive, long lasting, ready-to-wear B.T.E. 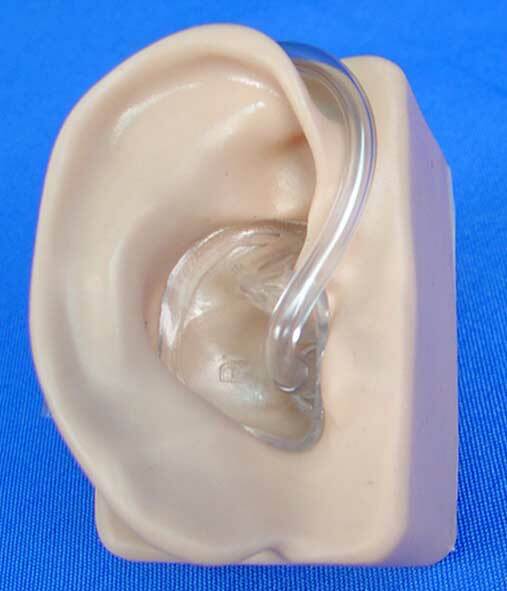 aid and headset earmold that can be fitted in one quick visit without making an impression. The innovative concave design in 8 sizes will customize itself to fit 95% of the population and provide hours of comfort, even in young sensitive ears. Doc's Promold is made of soft, hypoallergenic Kraton, with a memory that provides a seal to prevent high gain feedback. We offer you a money-back guarantee if you're not completely satisfied. This drawing shows the unique Unibody construction of a Doc's Promold. The Promold has a Built-in connector that provides secure coupling of tubes and adapters. The Custom Made earmolds are expensive, made by injecting a soft material into the canal. This firms up and produces an impression. The impression is sent off to a lab, where the impression is used to pattern an earmold. Most of these molds are much harder than the Promold. Some are softer than others are, but not as flexible and comfortable as the Doc's Promold in general.